This update fixes some lingering bugs and rounds out some of the final core features. After building residences, you can begin to create commercial buildings that milk your corporate residents for more profit. Importing goods and selling them to a large consumer base is very profitable, opening up new paths of specialization. I have fixed various issues with trade since the last update. Goods now fluctuate in price, which means players can build lots of warehouses and stockpile goods when they are cheap, then sell them a bit later for cash. I am reworking the research/upgrades to add more interesting passive abilities and specializations. 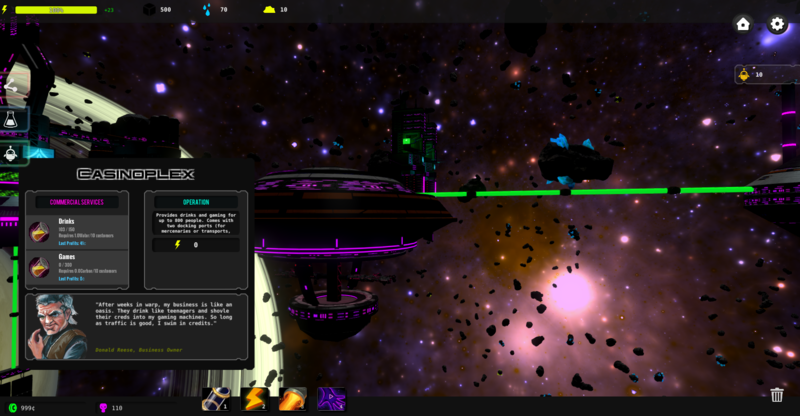 Though I plan to add maybe one or two additional smaller features, the majority of the core game is now done. I'm very happy to focus more on game balance and content development. The save/load user interface and functionality have been updated/improved. Incompatible saves should automatically be deleted. Goods now change prices. Some goods change more often, change more drastically, have more extreme min/max prices, or are more likely to follow trends (will gradually change value instead of radically swinging). Updated "storage" mechanic -- use the trade menu to expand storage for any good after building more warehouses. Stockpile goods and sell them at their highest. Good price changes are now shown as notifications. Added a medium-sized carbon freighter. Can buy or sell a lot more carbon than smaller ships, but doesn't spawn as often at lower levels. Fixed a pooling error that didn't properly reconnect buildings after scrolling too far from the base. Fixed an error where some pooling queues were not properly expanded (resulting in errors when trying to fetch a copy). 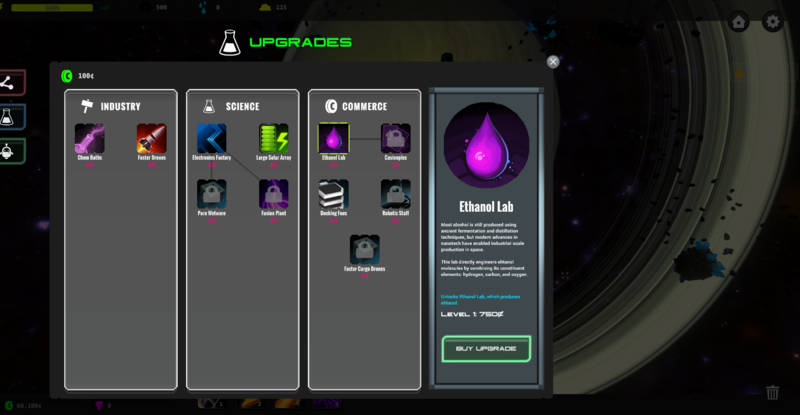 Added an improved "upgrades" screen. Upgrades are now separated into categories. Invest into any one specialization to unlock more advanced upgrades. Added commercial structures! The Casinoplex offers drinks and games to residents. Supply it with the new "Alcohol" good for maximum profits. Quick Update: linux build now ready!